Eric P. Scott, middle back row. Click on the picture to see it larger. Partimus Board member Elizabeth Krumbach Joseph has written a thorough and moving homage to Eric here on her personal blog. 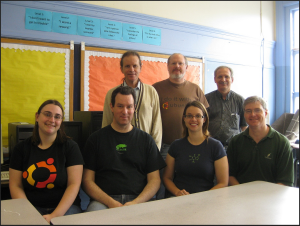 I cannot personally improve on that blog, and so will only speak briefly to summarize the wonderful things that Eric did from my perspective as a relatively simple end user of free open source software. Whenever I organized an event of any kind around free open source software, I could always count on Eric to bring his deep knowledge about free open source software to the event. From my perspective as a relatively simple end user, I always needed someone with Eric’s skill base to attend these events, because I didn’t have that kind of technical knowledge. I would have an overview as to what the teachers wanted to accomplish with a computer network, but I was not capable of doing anything other than reaching out to others to give specific shape and form to the teachers’ needs. Eric’s deep technical knowledge and his frequent appearance at my events meant that I always had at least one person in the room who could handle just about any technical problem that could come up. Eric’s advanced skill level meant that he could easily charge hundreds of dollars per hour for his skills, but he was always very giving of his time to schools, teachers and ultimately children who would never be able to afford his talent. Eric’s deep skills also meant that the job would get done quickly, and done correctly the first time, which meant that there was a lot of time to put polish and professionalism on the jobs we did. We were not fumbling around for solutions, thanks in part to Eric’s guidance and his ability to zero in on just the right solution at the right time. Oh, and he often also brought just the right physical tool that others might not have thought to bring, which speaks to his incredible foresight and presence of mind. Eric was also a renaissance man, widely knowledgeable about any topic that would come up. He always was ready with a funny comment, or an interesting bit of information on any topic. Bringing together a group of volunteers to give generously of their time is so much easier when there is a good esprit de corps, and Eric’s bright wit, technical chops, and presence of mind helped buoy the group’s spirit to keep them going despite occasional frustrations with the challenging economic and logistical circumstances facing the schools, teachers and students we serve. The above photograph of our group of volunteers is a fitting one to remember Eric by, as directly over our heads stands an inspirational motto taught to the children of the KIPP system. The children are taught to do the right thing not to avoid punishment or to seek a reward, but because, as the “Level 6” sign says almost directly over Eric’s head: “It’s my code. This is who I am.” That statement fits Eric to the letter. He gave of himself because that is the kind of person he was: generous, thoughtful, industrious, insightful, and caring. Eric, on behalf of Partimus.org, I want to thank you for masterful technical guidance, your considerable donation of your valuable time, and your unswerving generosity of spirit and leadership. My life is greatly enriched for having known you, as are the lives of the students and educators you have served. Additional discussions of Eric’s departure and remarkable giving life can be found here. This was written by Christian Einfeldt. Posted on Sunday, January 25, 2015, at 4:34 am. Filed under News. Tagged eps, Eric P. Scott, volunteers. Bookmark the permalink. Follow comments here with the RSS feed. Post a comment or leave a trackback. This beautiful blog brings comfort to Eric’s father and to me (his mother). It is gratifying to know that he had caring friends and that he will be remembered.